Congratulations to Lilli Blackburn, giveaway winner! 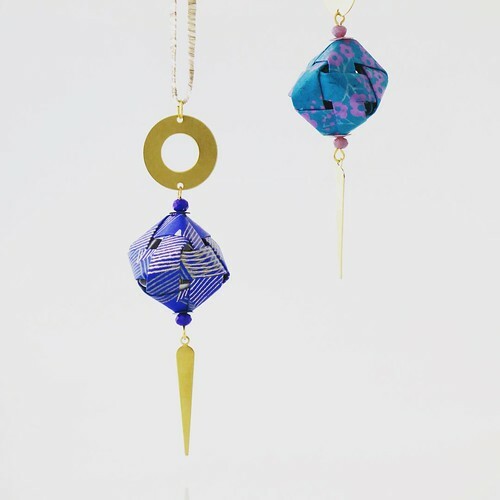 I first featured Renata Mayumi's sophisticated Mayumi Origami Jewelry almost two years ago in this post, and am delighted she is offering a giveaway in time for Mother's Day. 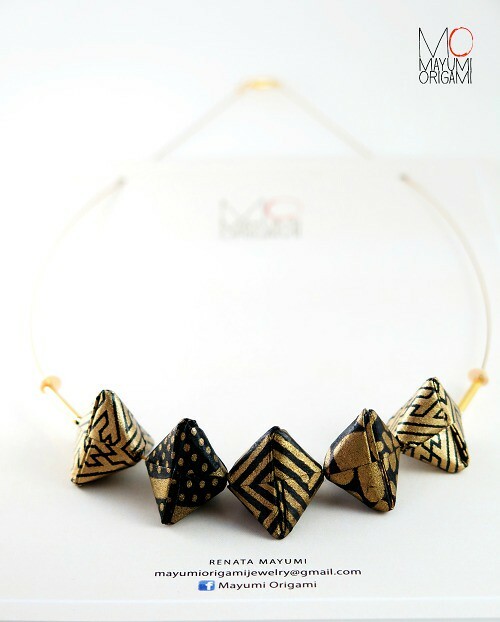 Renata's array of geometric designs continues to expand, and I'm in constant admiration of the unique findings she uses to create each piece.... for example, these stylish Spike necklaces. Each perfectly folded structure is protected with a non-toxic, acid-free and water-resistant lacquer. And now the giveaway! 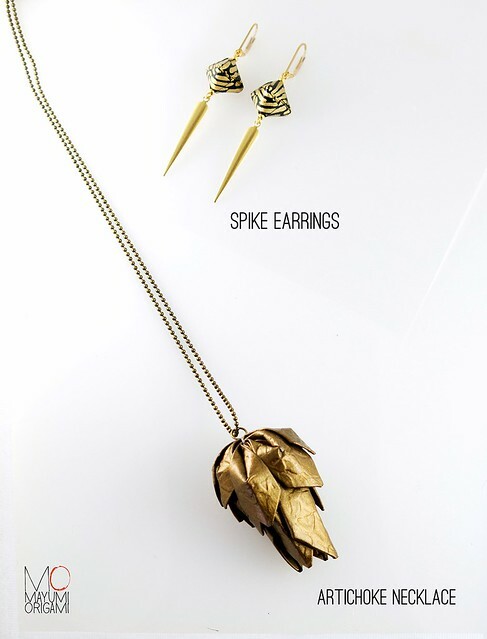 Renata will be giving both the Golden Artichoke Necklace and Black and Gold Spike Earrings you see pictured below to one lucky winner with a U.S. mailing address in time for Mother's Day gift-giving. The Artichoke Necklace has a nickel-free antique gold brass chain that measures 31 inches (80 cm). 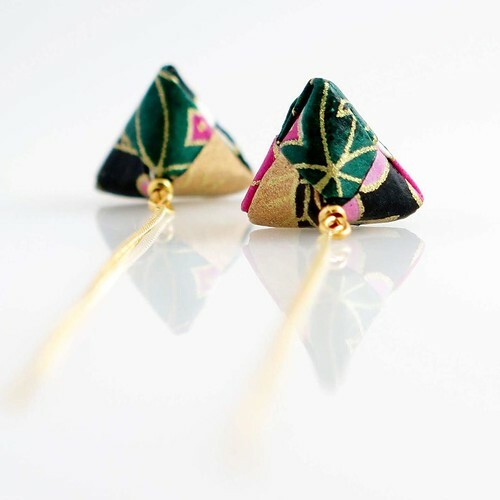 The Spike Earrings have nickel-free, gold-plated brass posts and measure almost 2 inches (5 cm) in length. These pieces are light as a feather, yet durable. To enter, post a comment below. Be sure to include a way to be contacted within your comment as unfortunately Blogger doesn't allow me to see the entire comment form. For those who would rather not post a visible email address, enter your comment and send me a quick message at ann.b.martin@gmail.com so I will be able to contact you if your name is drawn as the winner. If you are on Instagram, you have the option to earn an extra entry by visiting the giveaway photo and following directions. Giveaway ends: Saturday, April 23, 2016. The winner will be announced on this post and on Instagram after she or he has been notified. 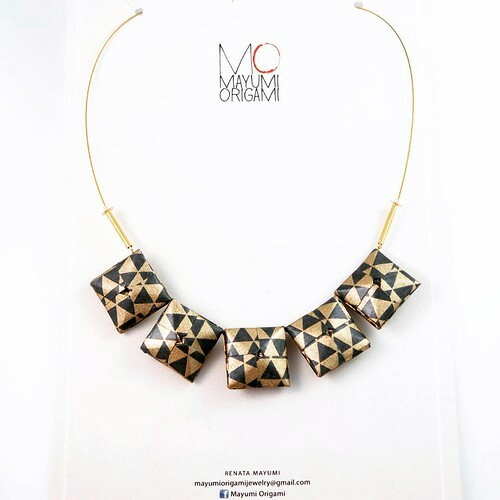 Renata does not have a website (yet), but you can purchase any of the jewelry styles you see here or ask her to create a custom piece in your choice of colors by contacting her at mayumiorigamijewelry@gmail.com. Prices are reasonable, ranging from $18-27 (16-24 euros). Payment is via PayPal. I can personally assure you that the jewelry is beautifully handmade, packaging is exceptional and shipping is efficient - my order arrived within five business days. By the way, Renata doesn't just fold paper... she has been busy creating a new line of origami-inspired earrings from 925 silver with black zirconia accents that are so pretty! 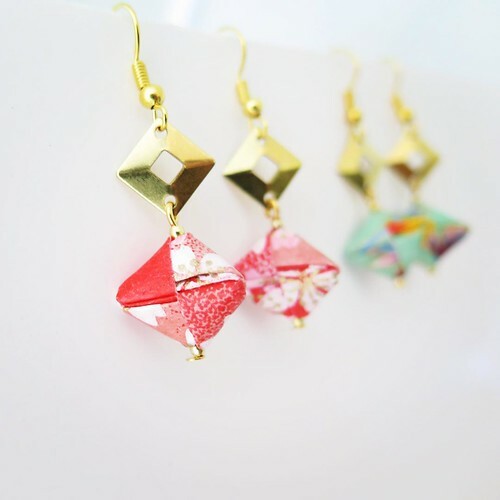 Mayumi Origami Jewelry is also on Facebook and Pinterest. Beautiful work! Love those spike earrings. What fun jewelry. 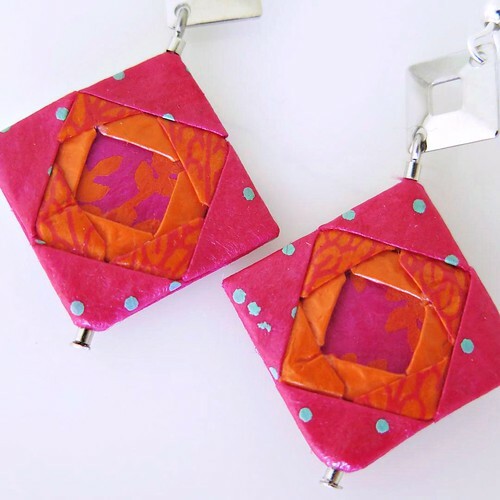 I love origami patterns and it is fun to think you can wear the patterns too. Thanks for the chance to win. Pick me! Pick me! This is beautiful jewelry! Would be proud to wears any of it! Renata's designs is so elegant....difficult to pick a favorite - LOL! Thanks for the chance to win! 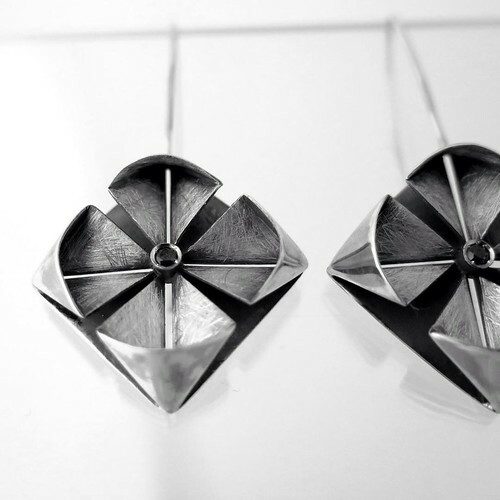 It would be difficult to choose only one of these origami jewelry pieces. It would not be difficult to win a piece. Beautiful work, and thanks for posting it. These are lovely! I am especially charmed by the artichoke as it is artichoke season here in California and they are everywhere in the markets now. This looks just like the little ones that make such tasty braises. Her work is elegant and also fun. I will look forward to seeing her Website. Gorgeous accessory pieces to add style to any outfit. Amazing jewelry! I would love to have for Mother's Day. It is amazing to see what can be done with simple paper. The paper itself can be shaped, molded, colored, drawn or painted upon, and formed into a variety of design for fashion. This jewelry is beautiful! Would love to own any of the pieces shown. Will consider buying for myself and others. This is awesome! I'd love to win it. I love all of your designs! I would love to win any one of them. The giveaway has ended. Thanks for your entries, everyone! Just purchased two beautiful origami earrings made by Renata at Lola- Galeria De Arte in Belem, Portugal. Absolutely exquisite! Would definitely order from her as her work is stunningly beautiful. So glad I happened upon this treasure! Thanks for letting us know, Satya! I agree with you; Renata's work is even prettier in person than the photos show.